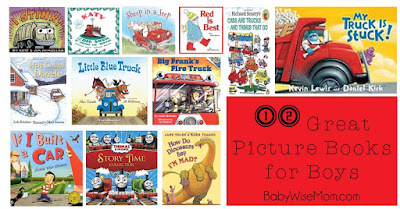 If you try to look up a list of ideas of picture books for boys, you will probably have a hard time finding success. We are kind of a little afraid to label things these days as for “boys,” which is interesting because if you try to look up a list of ideas of picture books for girls, you will have great success in finding ideas. 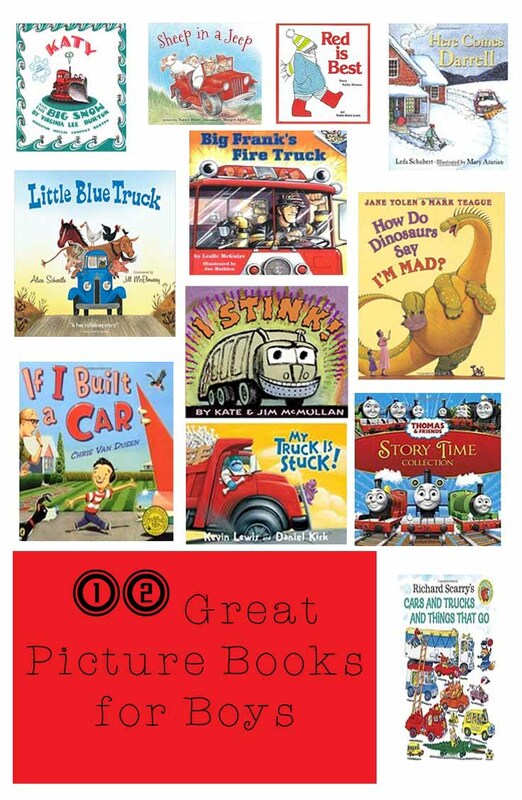 And so we have my list of great picture books that will likely appeal to boys. This isn’t to say that girls won’t enjoy some or all of these books, also. It also doesn’t mean all boys will love all of these books. I will say this, however. I bought these books when Brayden was young because he loved them. We have owned them through three daughters. I easily read all of these books with Brayden more times in one month than I have in the 9 total years that I have had daughters (and one of my girls is not into “girly” books). They just don’t choose them as often as other books. So I will say they tend to be more appealing to boys than girls. And these aren’t all of the books he loved as a young child; just the ones he totally loved that didn’t appeal to any of my girls. Noticeably missing from this list are books that center around sports. Brayden was so into trucks, cars, and trains when he is little that we primarily read books in those themes. I don’t want to recommend a book I didn’t have a child love, so I don’t have any listed, but if you have a child who loves sports, be sure to look up books on that topic. This post contains affiliate links. This does not increase your cost at all. This was Brayden’s all around favorite book when he was a young boy. It rhymes and it is about trucks. This author has a lot of other books, so be sure to check those out, also. This is a funny book about a group of sheep who don’t always make the wisest decisions on their road trip. This is a book that will appeal to girls as much as boys. And if your child loves the Sheep in a Jeep, there are a lot more “sheep” books from this author. This book takes you through the different aspects of a fireman’s day. This was such a favorite for Brayden. This is a fun book about a boy who describes his ultimate car. The car is completely unrealistic, but it is the kind of things kids like to do–dream big. Brayden loved to read Thomas and Friends books for many years. This is a great series for the train-obsessed children. This is about a snowplow after a big storm. Katy saves the day! This book follows Darrell around the seasons as he uses his vehicles to help people out around town. It is a great book that focuses on serving your neighbors and on trucks. This is a great book about helping others (even when they aren’t kind to you first). It also has farm animals, so it is appealing to the animal lovers as well as the truck lovers. There are a lot of books in the “How Do Dinosaurs” series. They clean their room, say goodnight, go to sleep…there are a lot of options. If you have a dinosuar lover, this is a fun series that also helps teach the correct way to react to situations in life. This is not so much a boy book as just a great book. This book was a favorite of Brayden’s and inspired him to have red as his favorite color for many years. This book is about a garbage truck. 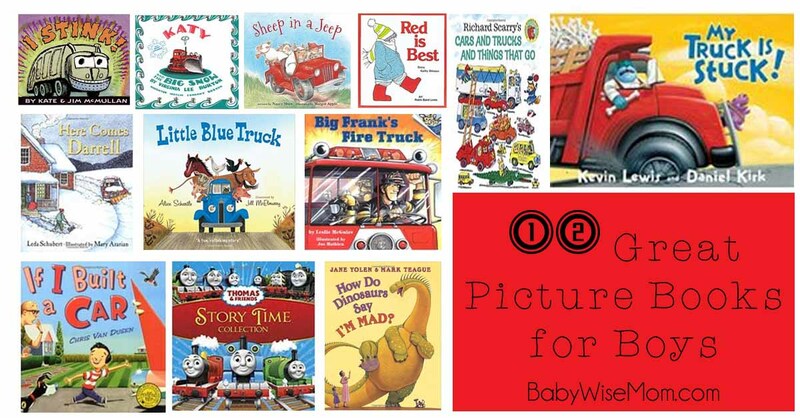 These authors have more similar type of books (about fire trucks, bulldozers…), so you can find one that is appealing to your child. I have to start with an apology–Richard Scarry books can be hard to read to children! There is so much going on each page and sometimes the books are pretty long. But they have lots of information and children love to find out how different things work. Awesome Jerusha! Another series my son liked was the Tonka Trucks books. I bet your son would like those, too!